Typical Blood Pressure monitors are big, bulky, and nearly impossible to use without assistance. The WrisTech is compact and lightweight and easy to use even by yourself! Just use the velcro straps to easily secure WrisTech to your wrist and push the green button. 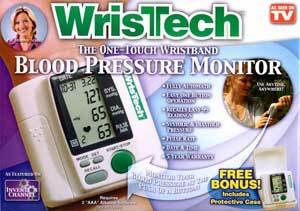 In less than one minute youll have systolic blood pressure, diastolic blood pressure and your pulse rate. The display is large and easy to read.